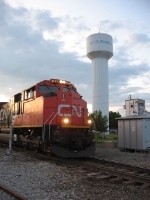 Title: CN 8001 at Pokegama Yard. Description: CN 8001 on the point of train A438 at Pokegama Yard. Description: CN 501 heads west. Description: CN 8817 Leads 396 East into Battle Creek With CN 8001 shut down with alternator faults. Description: southbound on Detroit sub. Description: Due to the vehicles between me and this motor, I had to use the zoom to reduce the garbage. Description: Pretty winter scene in the tiny town of Zephyr. Description: Pretty sunset scene at McCowan Road crossing. Description: DP unit powers an inbound intermodal past the abandoned lumber siding at Slater's Road. Description: L506 heads for New Brighton after interchanging with the BNSF at Northtown. Description: EMDs and autoracks transition from the J to the GT eastward at 1052.